Trying Not To Die, 2009. Installed at Heskin Contemporary, NYC. 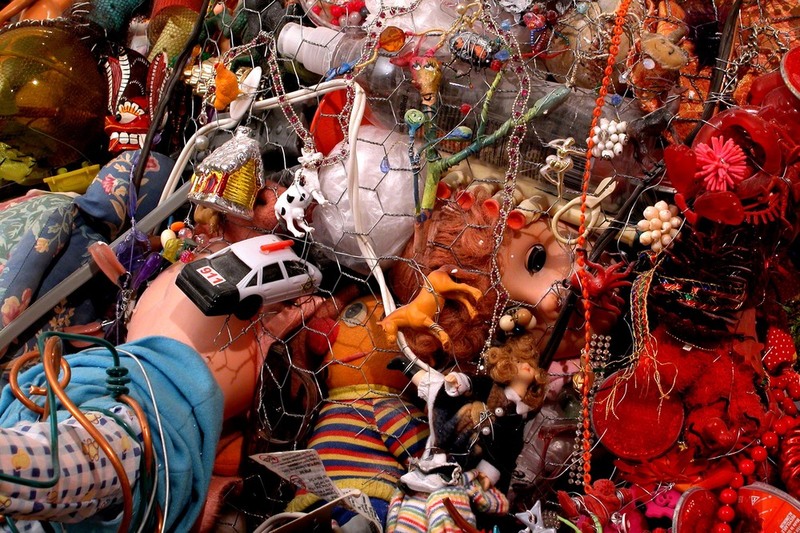 Clothing, twigs, insects, trash, thread, fabric, wire. Variable Dimensions (clothing fits a 5' tall woman). Pipe Girl, 2003. Pipe and other found objects, epoxy clay, gouache. Variable Dimensions. Created for my solo exhibit "Connected" at Heskin Contemporary in NYC, 2013. For the exhibit I created several unconventional portraits using the ephemera from each "sitter" to describe them. This is portrait of a twelve-year-old girl. It contains several objects she gave me. Found objects, wood, screws, epoxy clay, Aqua Resin, fabric, thread, acrylic paint, thread, pencil, wire. Everything Nice, 2009. Installed on the wall with painted elements on the wall at Heskin Contemporary, NYC. Found objects, wire, fabric, thread, wood, epoxy clay, Aqua Resin, pen, pencil, gouache. Variable dimensions, about 14" x 12" x 16"
Too Much Candy, 2004. Installation at Living Arts, Tulsa, Oklahoma. Included in this view: The Princess, Extreme Soldiers, Wound & Virus-Astrodeath. *This exhibit was made possible with a grant from the Andy Warhol Foundation. Wound, 2004. Detail. Part of Too Much Candy installed at Living Arts, Tulsa, Oklahoma. Plaster, wood, epoxy clay, acrylic paint, Christmas ornaments and other found objects. 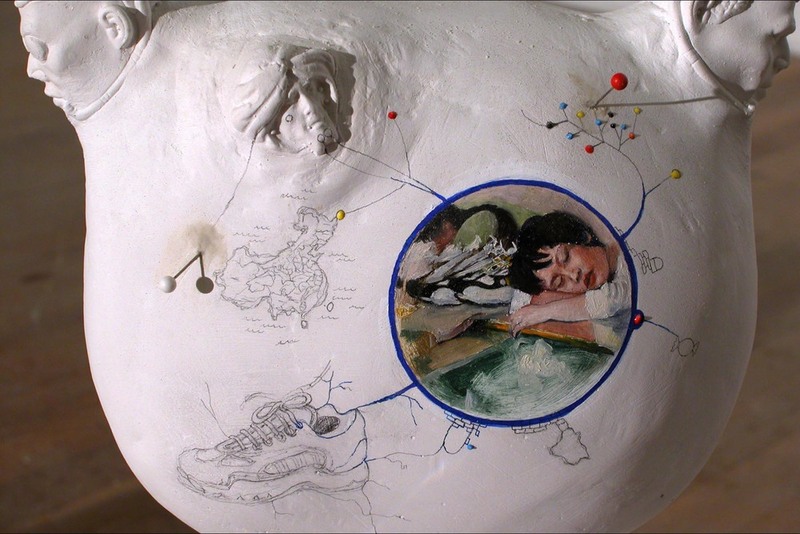 About the process of Virus-Astrodeath and Wound: Spackle was applied in layers then sanded to seamlessly adhere three-dimensional elements to the wall, then paint was applied over them. Variable Dimensions, about 5' x 5' x 2' including painted elements on the wall. The Princess, 2004. Installed at Living Arts, Tulsa, Oklahoma as part of Too Much Candy. Found objects, ceramic (the head), light bulb and fixture (the head lights up from within), fabric, plants (they lived inside the skirt, they were visible through a hole in the front),wire, thread, gouache. Variable dimensions, about four feet tall. Extreme Soldier (Worker), 2004. Installed at Living Arts, Tulsa, Oklahoma as part of Too Much Candy. Plaster, oil paint, fabric, thread, beads, detergent. Variable dimensions, about 22 inches tall. Extreme Soldier (Candy), 2004. Installed at Living Arts, Tulsa, Oklahoma as part of Too Much Candy. Plaster, candy, resin, fabric, thread, beads, detergent. Variable dimensions, about 22 inches tall. Extreme Soldier (Nature), 2004. Installed at Living Arts, Tulsa, Oklahoma as part of Too Much Candy. Plaster, fly, plastic lens, gouache, acrylic paint, fabric, thread, beads, detergent. Variable dimensions, about 22 inches tall. While We Were Sleeping, 2002. Resin, oil paint, plaster, flocking. Variable Dimensions, about 9" x 3" x 6" (not including green flocked base). The Nuclear Option, 2004. 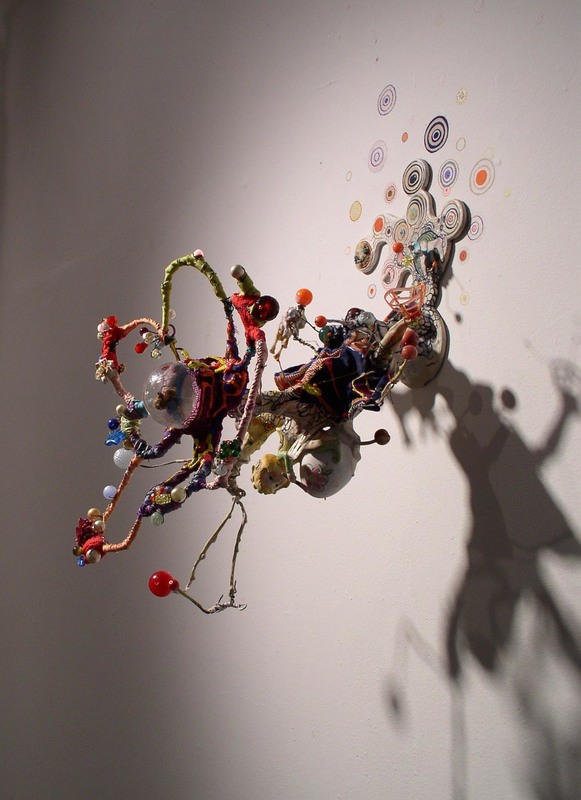 Styrofoam, epoxy clay, Aqua Resin, found objects, thread, fabric, wire, enamel paint. Variable Dimensions, about 30" x 16' x 16" In the collection of The New York Foundation for the Arts. Bling Bling & Bling, Two sculptures installed at Ethan Cohen Gallery, NYC, 2006. 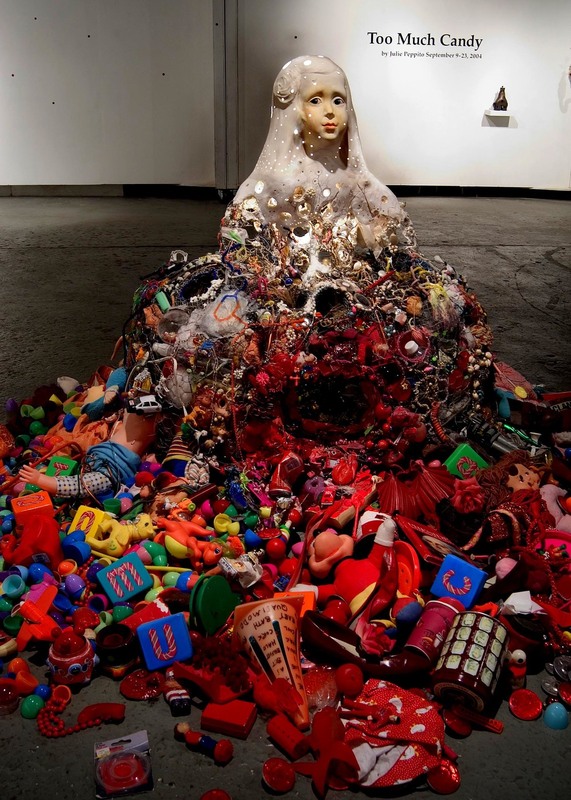 Both are constructed of found objects bound together with extension cords, yarn and wire, adorned with stuffed and sewn fabric, styrofoam & Sculpty appendages and nodes. Variable dimensions: Bling Bling is about three feet in circumference not including wire fronds. Bling is about two feet in circumference. Princess Mickey, 2009. Installed hanging from the ceiling at Heskin Contemporary, NYC. 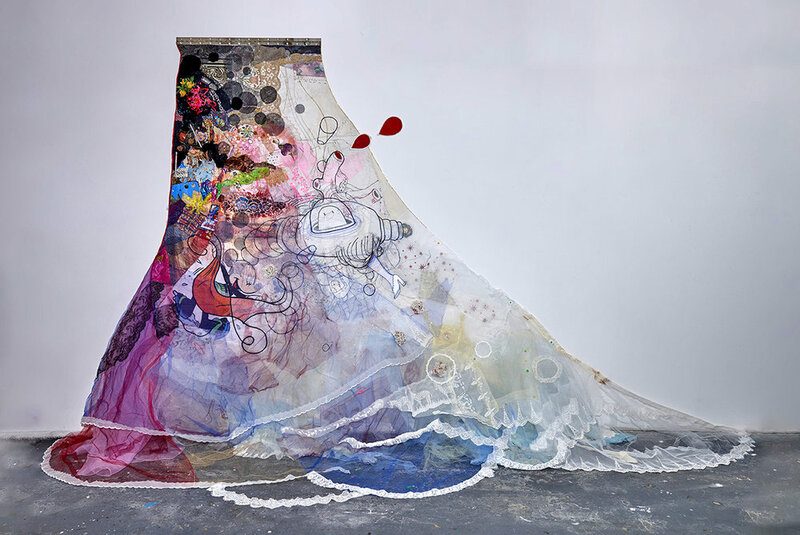 Found objects, epoxy clay, wire, Aqua Resin, pen, gouache, pencil, fabric, thread. Variable dimensions, about 16" x 18" x 16"